The scientist-centered sitcom will be on the air through at least the 2013-2014 television season. Leonard, Sheldon, Howard, Rajesh, and Penny will keep up the shenanigans for at least three more years. The Big Bang Theory, currently in its fourth season on broadcast network CBS, has just been renewed, guaranteeing new episodes through 2014. The show revolves around two physicist roommates, their colleagues at the California Institute of Technology, the woman who lives next door, and the wacky hijinks that ensue when the super-smart and the average-smart collide. Deadline quotes a press release by CBS President of Entertainment Nina Tassler, who joked, "It doesn't take a theoretical physicist to see why this show is a BIG part of our comedy future. From ratings to critical acclaim to pop culture buzz, it's struck a chord on all levels." The coveted 18-49 year old level is where the series strikes the most crucial chord: The Big Bang Theory is the most-viewed scripted series in primetime for that demographic. The show is doing well enough that its new license fee (the amount CBS pays for the rights to broadcast the program) is now upwards of $4 million per episode, which is more than four times the show's current fee. 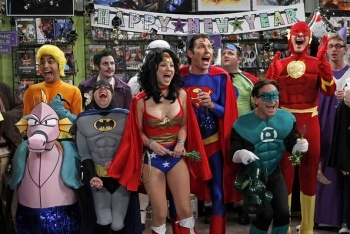 Warner Bros. produces The Big Bang Theory, and has been able to foray its success into $2 million per episode in the sale of syndication rights. Additionally, the highly successful show recently moved from Monday to Thursday night, shifting to what Deadline calls, "the most lucrative night of television."